Cashew Ranch Dressing is oil-free, creamy, and easy to make in minutes with only a few basic ingredients. It’s delicious on salads, tacos, and as a dip. This recipe is naturally vegan and gluten-free. I’ve always been a fan of ranch dressing. I always thought it was folklore that it originated from “Hidden Valley Ranch,” but it’s actually true. And Americans have been loving ranch dressing ever since! It’s a key ingredient in my favorite Buffalo Ranch Chickpea Taco Salad. I also love it on Soyrizo Potato Tacos. And it’s delicious drizzled on Pumpkin Chili. And while it’s easy to find vegan versions in supermarkets these days, did you know it’s incredibly easy to make a much healthier version at home? In fact, all you need to make oil-free Cashew Ranch Dressing is raw cashews, water, a few simple seasonings, and a blender! You can also make this recipe to suit your tastes. If you prefer a more tangy dressing, you can add extra lemon juice or some apple cider vinegar. Besides serving Cashew Ranch Dressing on salads, it also makes a great dip for fresh vegetables. I often eat it with carrots, celery, radishes, bell peppers, and cherry tomatoes as a snack. It also makes a delicious sandwich spread. Since it thickens up a little in the refrigerator, if you want a thinner sauce, you can add a little bit of water. I like to store it in a glass bottle or reusable plastic squeeze bottle. It will stay fresh close to a week. Now let’s make Cashew Ranch Dressing! What is your favorite salad dressing? Do you use Ranch as a dip? What are your favorite foods to eat with Ranch? 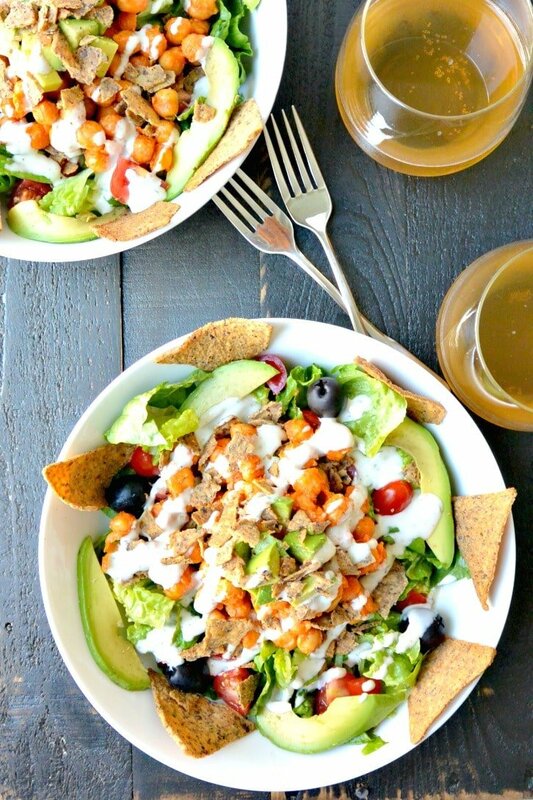 And if you’re looking for more ways to use Cashew Ranch Dressing, check out the recipes for BBQ Ranch Chickpea Salad and Southwest Pasta Salad. 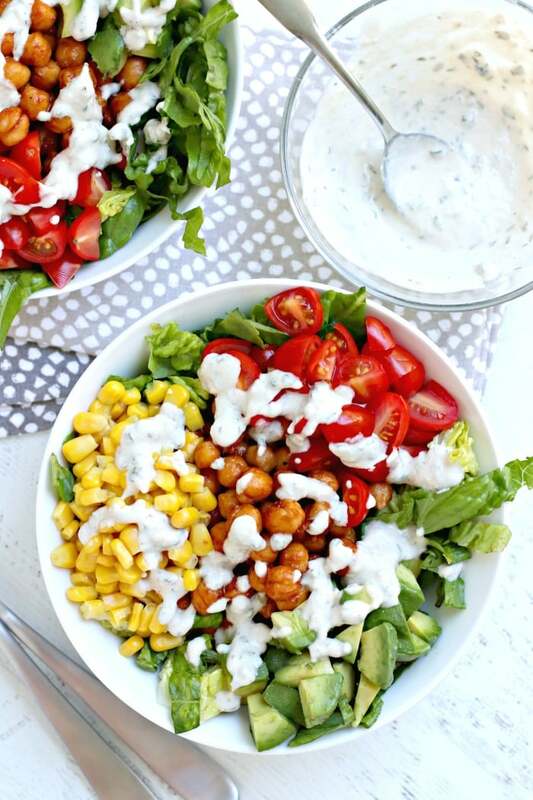 Cashew Ranch Dressing is easy to make with only a few basic ingredients. It's vegan, oil-free, and gluten-free. Enjoy it on salads, tacos, and as a dip! Makes about 1 cup. In a high-speed blender, combine the cashews, water, lemon juice, garlic powder, and onion powder. Process until very smooth. Stir in the dried parsley, dried chives, and salt and pepper, to taste. For the Nutrition Facts, a serving is one Tablespoon. For a thinner dressing, add a little more water. If you want a more tangy dressing, try adding additional lemon juice or some apple cider vinegar. You can also add additional herbs such as 1/2 teaspoon of dried dill. Ranch is a STAPLE in my house!! I make a huge batch every week and use it with everything ha! I love it mainly on salads! Nice! I’m glad you’re a huge fan, too! I definitely am going to try this recipe out! I love that this is so easy and way healthier than store bought. I love the seasonings you have added. It sounds delicious. Thank you, Mel! I used to get the store-bought kind, but now I wonder what’s actually in it. I love cashew ranch! In fact I just made some this week 🙂 Will have to try your recipe next time! Thanks Sarah! There are a lot of great ranch recipes out there! I used to live off Ranch as a kid 😉 Dipping raw broccoli and cauliflower were my favorite ways to eat it 😛 Haha! You can’t go wrong with that combination! Excellent dressing recipe, Amy! Can I add a bit of lemon zest in addition to lemon juice? Thanks Agness! Yes, that’s a great idea! Thanks for including the nutritional information, just wondering what the serving size is as I can’t seem to locate one. Assuming it’s a tbsp? LOVE adding dill! Thanks Hannah! You’re right, a serving is a Tablespoon. That’s wonderful to hear, Andrea! Thank you! Making it! How long does it keep in refrigerator? I hope you enjoy it, Debby! It should last about a week. This is in my favorites folder, it’s the BEST dip for cauliflower buffalo wings, among other things. I make it as written except double all the spices/herbs… amazing! I’m so happy you enjoyed it, Claudia! Added dill and a bit more lemon juice. So delicious! My husband who always used Ranch love this instead! For those of us that do not/cannot eat cashews? Have you made this with other nuts? Perhaps Brazil nuts or macadamia? Hi Camilla, I haven’t tried it, but I recommend trying raw sunflowers as a substitute for raw cashews. I also like your idea of using macadamia nuts. I wouldn’t use Brazil nuts though. While I love them, in larger quantities they can be toxic to the body. Most recommendations say to limit them to 2 a day. Oh gosh! I’m on a detox and there are things I can’t have but this just made my day. It definitely hit that spot! Thank you so delicious!